On August 26, 2010, a violent clash broke out between Jewish and Arab residents of Silwan, a predominantly Muslim village outside the southern end of the walled Old City of Jerusalem. The name derives from the biblical "Shiloah" and its subsequently Graecized "Siloam." On the face of it, the sparring that erupted over a gate built illegally by Arab residents may seem like a miniature version of the ongoing conflict between Israelis and Palestinians over who controls the Holy Land. But reducing the struggle to a mere real estate dispute misses a critical point in understanding the persistence of the larger conflict. For the battle of Silwan is a microcosm of a larger fight, one in which one side, the Palestinian, seeks to erase the existence of the other—not merely through traditional armed conflict but also by rewriting history. The tactic of denying a Jewish past to sites and holy places in the Land of Israel is of relatively recent vintage in the Arab-Israeli conflict but one that has increased dramatically in the past few years. Notwithstanding Palestinian denials of the Jewish roots of Silwan, they are much in evidence to the casual observer as can be seen here where Arab homes are literally built atop ancient Jewish tombs carved into the limestone hillside. Its identity with the site of Solomon's Temple is beyond dispute. This, too, is the spot, according to universal belief, on which "David built there an altar unto the Lord." There is not [even] the smallest indication of the existence of a Jewish temple on this place in the past. In the whole city, there is not even a single stone indicating Jewish history. Our [Muslim] right, on the other hand, is very clear. This place belongs to us for 1,500 years. The Western Wall, until recently the only visible remnant of the Temple complex and the place at which Jews have prayed for millennia, has been similarly transformed. Muslims have renamed it the Wall of al-Buraq after the tethering place of the horse on which the prophet Muhammad is reputed to have taken his night flight to Jerusalem. Palestinians continue to deny a Jewish connection despite the likelihood that the Ottoman sultan Suleiman the Magnificent (r. 1520-66) reaffirmed Jewish rights to worship at the wall, or that three centuries later, the Muslim ruler Ibrahim Pasha (son of Egypt's viceroy Muhammad Ali) issued a decree regarding the site that allowed Jews "to pay visits to it as of old." Even the Tomb of Rachel in Bethlehem has come under assault. For centuries a pilgrimage site, especially for barren Jewish women, it is mentioned by the twelfth century Arab historian al-Idrisi and became a site of veneration for Muslims as well, known as "Kubat Rahil." In 1615, Jews were given exclusive rights to the tomb by their Muslim ruler, and again, in 1830, the Ottomans recognized the legal rights of the Jews to the site. Sir Moses Montefiore was permitted to purchase the site in 1841, at which time he restored the tomb and added a small prayer hall for Muslims. Since 1996, however, Palestinians have taken to calling it the "Bilal Bin Rabah Mosque" claiming it as the burial place of Muhammad's first servant although there are centuries-old sites in Damascus and Jordan that have long-made that claim. In 2010, the heavily politicized organization, UNESCO, joined the Muslim deniers and demanded that Israel remove the grave from its National Heritage List and cede control of it to the Palestinians. We do not agree with the biblical version, according to which there was a tremendous kingdom or the capital of a tremendous kingdom. No castle has been uncovered and no remnants have been found of the First Temple, the one that was supposedly built in the period of Solomon that would testify to this size … The Hebrews reached Jerusalem in the first century B.C.E. and their sovereignty over Jerusalem was only for a short time … Up until today, it is impossible to point to any characteristics in Jerusalem that can be attributed historically to this period. There is no historical characteristic that is related in this manner to a Hebrew culture. Arab spokespersons from across the political spectrum and from many different fields work enthusiastically to negate every archeological claim that recognizes a link to the Jewish people from the First or Second Temple periods. This sentiment is echoed across the Palestinian spectrum, including popular outlets on television and in newspapers. For example, Yunes Amr, president of al-Quds Open University, pointed out the inaccuracy of the widespread view that the Palestinians originated with a group of people who emigrated from the Greek Isles and settled in Palestine, claiming instead that the Palestinians are Arab Canaanites indigenous to this land. They dug the Western Wall tunnel ... and at the heart of the tunnel, they inaugurated a new synagogue, the closest—according to their illusion—to the holy of holies of the alleged temple. Yasser Arafat argued at the Camp David negotiations in July 2000 that the Jewish temple was not on the Temple Mount, claiming that the Qur'an proved that the temple was not even in Palestine. This method of erasing the Jews from Jerusalem is very popular in Palestinian academia, with PA officials, and religious leaders—and has infected an entire generation of Muslims, both inside and outside the state of Israel. Despite these strident falsifications, there is no doubt that the Jewish people were established in Palestine long before the land bore that name. In fact, the town of Silwan is, to some degree, the epicenter of that long history, perhaps explaining the ferocity of the current uproar. Many people incorrectly assume that what is today termed the "Old City" of Jerusalem is identical to the city taken by King David from the Jebusites (a Canaanite tribe) sometime in the eleventh century B.C.E. and subsequently turned into the capital of the united Israelite kingdom. Actually, there is abundant and growing evidence that the "City of David" was outside the present walls of Jerusalem, built on a rocky promontory that is now part of the village of Silwan. Excavations by European archeologists in the nineteenth century, and accelerating since the Israeli recapture of Jerusalem in 1967, have revealed ancient and massive structures that were the original Jerusalem. Recent finds of seals and bullae (pieces of clay stamped with seal impressions) with Hebrew text, including at least two with the names of royal officials mentioned in the book of Jeremiah, have led archeologist Eilat Mazar to argue that parts of the site were the palaces of the Davidic and Judean kings. Both the City of David and the previous Jebusite stronghold had been watered by the nearby spring of Gihon, still a reliable source of water for the area. Even in ancient times, a channel had been cut to a man-made pool in order to store water during periods of drought; this was the "Shelah (sent) Pool to the King's Garden" mentioned in Nehemiah, 3, 15. In response to the threat of siege by the Assyrian king Sennacherib, an older, open-air aqueduct was plugged and a tunnel carved through the bedrock from the spring to the pool by King Hezekiah (c. 715-686 B.C.E.). A Hebrew inscription testifying to this ancient engineering marvel was discovered in the late nineteenth century and is now housed in the Istanbul Museum. The central area of the modern town of Silwan appears to have been built atop the nearby necropolis of Judea's elite as attested to by roughly fifty tombs found in the area. After the destruction of the First Temple in 586 B.C.E. and the return of the Judean exiles, the city grew significantly but the renamed Siloam and its environs were still integrally connected to it. Massive steps leading up to the Second Temple from the Shiloah (Siloam, Silwan), the powerful spring outside the city walls, have been excavated. Josephus, the first-century Jewish historian, mentions Siloam frequently, making a connection between the might of the spring and the destruction of the Second Temple. According to him, before the coming of Titus, the waters of the Shiloah and the rest of the springs close to the city decreased. But, at the time of Titus, the spring provided enough water to quench the thirst of the enemies of the Jews. The same phenomenon occurred before the destruction of the First Temple by the Babylonians, and Josephus used it in his attempt to convince the residents of Jerusalem to surrender. The story of Jesus and the blind man made the Pool of Siloam a pilgrimage site in the Byzantine period, and the Gihon spring was at some point renamed the "Fountain of the Virgin." The Church of Siloam as well as the City of David/Wadi Hilweh section were inside Jerusalem's walls during the Byzantine period. Meanwhile, hermits and monks took over the tombs outside the walls and lived there, adding an additional layer of significance to the site for Christians. Remains of a church dating to the fifth century C.E. were uncovered at the City of David excavations by modern archeologists. A map from 1917 still shows a church close to the pool, a structure that was likely converted into the so-called Mosque of the Spring that was the subject of the fight mentioned earlier. The village of Sulwan is a place on the outskirts of the city. Below the village is the Ain Sulwan [Spring of Siloam], of fairly good water, which irrigates the large gardens which were given in bequest [waqf] by the caliph Othman ibn Affan for the poor of the city. Lower down than this, again, is Job's Well [Bir Ayyub]. It is said that on the Night of Arafat the water of the holy well Zamzam, at Makkah [Mecca], comes underground to the water of the Spring [of Siloam]. The people hold a festival here on that evening. Othman (or Uthman) ibn Affan (579-656 C.E.) succeeded Umar as the third of the "rightly-guided caliphs," a term bestowed by Sunni Muslims on the immediate successors to Muhammad indicating a veneration of their actions and statements, which has tremendous significance to the modern-day conflict as does the legend recorded by Muqaddasi. Silwan's fortunes seesawed over time. The Muslim biographer and geographer, Yaqut al-Hamawi, wrote in 1225 that "in his day there was a considerable suburb of the city at Sulwan and gardens," but less than a century later, the author of the Marasid, a geographical dictionary written around 1300 C.E., stated that "the gardens had all disappeared, that the water of Sulwan was no longer sweet, and that the buildings were all in ruin." Closer to modern times, Israeli geographer Menashe Harel relates that in the mid-1850s, the villagers of Silwan were paid £100 annually by Jerusalem's Jews in an effort to prevent the desecration of nearby graves on the Mount of Olives. This fraught relationship between the two communities took a new turn late in the century with the arrival of Yemenite Jews into the town. Inspired by a messianic desire to return to the land of their forefathers, between 1881 and 1882, a group of penniless Yemenite Jews came to Jerusalem. The long-time Jewish inhabitants of the city initially rejected their coreligionists but eventually built homes for them in the Silwan area, creating a neighborhood that became known as Kfar Hashiloah (Shiloah Village) and the "Yemenite Village." During the pogroms of 1921 and 1929, these homes were attacked by Arab neighbors, and in 1939, at the end of the three-year Great Revolt against the British mandatory authorities, the Yemenite Jews of Silwan were evacuated, their homes soon occupied without compensation by the neighboring villagers. Thus, both the area of the City of David and the neighboring town of Silwan had no Jewish residents until 1967. The City of David and the bulk of the village of Silwan are built on two opposing slopes of the Judean hills through which runs the Kidron Valley, named after the stream or wadi that flows through it to the Dead Sea; the Gihon spring essentially derives its water from the same source. As a result, this valley has since antiquity been more lush and better able to sustain agriculture than the limestone hills of the region. Known as "the King's Garden" in the Bible, it is said to be the source of inspiration for verses in Ecclesiastes ("I made me gardens and parks, and I planted in them trees of all kinds of fruit.") and the Song of Songs, both traditionally ascribed to David's heir, King Solomon. Regardless of who originally cultivated the area (and it is likely that the pre-Israelite Jebusites also took advantage of its verdure), under Ottoman, British, Jordanian, and Israeli control, the area was effectively left green. Since Israel reunited the eastern and western halves of the city, and as Jerusalem has grown in population, Muslim residents have moved illegally into "the King's Garden" and practically erased its lush character. The neighborhood of Silwan lacks adequate planning. This led to a situation in which the neighborhood lacks infrastructure on all levels: educational facilities, roads, sidewalks, community facilities, open recreational spaces, electricity, water, parking, and more … Under Ottoman, British, Jordanian, and Israeli control, the [King's Garden] area was always zoned and preserved as a park. In the past fifty years, about 700 Muslim residents have moved into the area illegally. Because current zoning still defines the area as a park, there is a similar lack of adequate infrastructure in the King's Garden. up until 1967, the garden contained only four structures on its southern side. However, the laying of sewage pipes triggered the development of massive, illegal construction in the area. Currently, there are eighty-eight structures inside the garden area, all of which were built without building permits on an area that had been preserved as a garden [for] thousands of years. The Silwan project would extend the boundaries of the City of David National Park, and according to the project's plans, twenty-two out of eighty-eight illegally built houses are slated for destruction. Compensation would be given to the evicted families plus additional aid to help them legally rebuild their homes elsewhere in Silwan. The rest of the existing houses in the area would be approved retroactively and legal proceedings against them dropped. Currently, no public center serves the residents of Silwan or surrounding villages such as Abu Tor and Ras el-Amood with after-school programs, a library, senior citizen programs, kindergartens, infant care center, or a public swimming pool. The residents lack access to these vital services provided to residents in other parts of the city. For the growing senior citizen population, the SCC will have a special wing devoted to senior citizen programming ... The roof of the SCC will have several public sports courts and a promenade looking out toward the Old City and Temple Mount. This planned project has stirred up Islamic and Palestinian organizations working in Jerusalem, along with other groups that have come out against this move by the Israeli authorities. The mayor's office sought to reach compromises with area residents including offering those Arabs whose houses are to be demolished first crack at operating tourist-related business in the park. Despite this, under pressure from the Obama administration and at the urging of Prime Minister Netanyahu, Jerusalem mayor Nir Barkat soon announced that he would delay the plan's implementation. The complaints against the project, however, include not only legitimate grievances about the destruction of (illegally built) homes and the removal of the residents to another area. Coupled with these criticisms are objections against the biblical and historical narrative that stands at the foundation of the plan as well as a religious imperative with no room for compromise. "Most Important Place in al-Quds"
Notwithstanding Mayor Barkat's temporary suspension, Palestinian opponents continued their fight against the plan. Al-Quds (Jerusalem) Foundation for Development—a nonprofit organization partnering with leaders from the Israeli Arab Islamic Movement such as Sheikh Raed Salah and al-Bustan Neighborhood Committee—distributed an alternate community-based plan a month later in which not a single home would be evacuated or destroyed. While acknowledging that the houses in the King's Garden/al-Bustan neighborhood were built illegally, the authors upped the ante by claiming that the garden's residents were actually refugees from the 1948 war who had originally been forced to move to the Ma'aleh Adumim area, west of Jerusalem. There they lived until they were forced to leave in 1967 to make way for the building of the city of Ma'aleh Adumim. They then settled in the Silwan area, and over the years, built their homes in al-Bustan without permission from the authorities. If the King's Garden plan were to move forward, this would be, in their telling, their third expulsion. In the city is a well-known spring known as "Silwan's Fountain" which is connected to the history of the city of Jerusalem. This water source was already established during the Canaanite period. The water was transported in sluices that were built by the Jebusites [the original builders of Jerusalem], and today there still exist archaeological remains showing the existence [of this water system] … The spring waters were the water supply for the residents of the city during the Canaanite period. Canaanite Jerusalem was dependent on the spring waters up until the Byzantine period. During Herod's reign, he built a portion of the spring's water pool, and this portion of the spring's waters was enough for him. During the early Islamic period, the Muslims took care of Silwan's Fountain and the Third Righteous Caliph, Uthman ibn Affan, expanded the spring and renewed it and dedicated Islamic dervishes to it in the temple. From this period, Silwan's Fountain and the land around was defined as belonging to the Islamic waqf. With a slight nod to the universally reviled King Herod (74-3, 4 B.C.E. ), the committee expunges all other ties Silwan has to Jewish history but significantly stresses the connection between the village, the waqf, and Caliph Uthman. The word waqf used above has two interconnected meanings. It is both a Muslim religious endowment and a body that manages and oversees the endowment. The basic regulations governing waqf trusts are interpreted by Shari'a law, but in essence, waqf property is absolutely permanent, and once established, the contract cannot be altered or the property sold. Furthermore, by linking the establishment of Silwan as waqf to Uthman, its existence as an everlasting Muslim inheritance is made all the more inviolable. Uthman as well as the three other Righteous Caliphs were companions of Muhammad, so close to him in Muslim telling that their deeds and words are to be emulated almost as much as Muhammad's himself. If Caliph Uthman dedicated Silwan as a Muslim waqf, no Muslim can change that fact without being charged as an unbeliever. During the second conquest of Jerusalem, [during the period of Salah ad-Din (Saladin)] Yusuf ibn Ayyub [i.e., Saladin] came and dedicated the village inside of which was the Spring to madrassa [Islamic religious school] as-Salihiyya, and he returned and renewed the village and the spring as a whole Islamic waqf. This area was part of the Islamic waqf for the thousands of years that passed since the conquering of Salah ad-Din. The spring is still under the supervision of the waqf and is a source of income for the waqf. The listing of the area as waqf was accepted only at the beginning of the nineteenth century. The listing includes all of the income from every part of the land that is found in Silwan including the spring that is found in the village. It is only fitting that the figure of Saladin is brought forward to justify the belief in eternal Islamic ownership of Silwan, despite there being no evidence in medieval Arab writings to attest to the tale. As the ruler who defeated the Crusaders and returned Jerusalem to Muslim control, who better to return Silwan as waqf to fellow Muslims? West Jerusalem's municipality is trying to lead with its plan to prove the existing reality according to the theories that appear in the Talmudic literature despite the fact that we are talking about Islamic land and Arab holy land. In order to realize that goal, the city has created and inaugurated a Visitors Center in the City of David, which is a part of the plan for the City of David. That is how the hikes through the Silwan Fountain tunnel began, hikes which end up at the pool of the Silwan Fountain close to Silwan's Fountain mosque. During the same hike, visitors are accompanied by Israeli guides who present the legend of the City of David and the establishment of the First and Second Temples and the efforts to build [today] the Third Temple in the place of the blessed al-Aqsa Mosque. Thus alongside the notions that Jews fabricate their history and that Silwan and its environs are a sacred waqf, opponents create a conspiracy of Talmudic Judaization of the city whose goal is the eradication of al-Aqsa Mosque to be replaced by a third temple. The trope of a perverted Talmudic Judaism is a favored one used by anti-Semites throughout the ages and most recently picked up and amplified by Muslim and Arab opponents of the Jewish state. In their fixation on the Judaization of Jerusalem, the pamphleteers echo a 2006 piece in Sawt al-Haq wa-l-Huiriya (Voice of Truth and Freedom) the journal of the Islamic Movement centered in Umm al-Fahm and led by Raed Salah, where the plan to Judaize Silwan is discussed in great detail. The Islamic Movement, a local branch of the Muslim Brotherhood, is at the forefront of organizing Israeli Arabs to identify themselves strictly as Palestinians with Salah leading the campaign to "defend" Jerusalem and "liberate" it from Israeli "occupation." The other image used by al-Quds Foundation is the alleged Israeli plot to replace al-Aqsa Mosque with a third temple—despite the fact that the Israeli authorities have consistently restricted the movement of non-Muslims on the Temple Mount to the point where they have been accused of discrimination against Jews and Christians. A pamphlet from the group Islamic Jihad-Beit al-Makdas uses melodramatic language to further illustrate the evil intents of the Jews, accusing Zionists of attacking Jerusalem, Silwan—"the gateway to al-Aqsa Mosque"—and al-Aqsa Mosque itself, which is "the rock of grace of Jerusalem and the crown of the whole Islamic nation." The authors thank those "who protect al-Aqsa and its gates and the residents of the village of Silwan" and informs them that the way is clear "to the temple, from Silwan, the aristocratic, the symbol of steadfastness at the gates of al-Aqsa Mosque." The authors ask "Would you like to be a guard [on watch] at the blessed al-Aqsa and nothing will pass by you?" and warn, "Do not let into your homes the flocks of the settlers." According to this line of thought, Silwan becomes the doorway through which the settlers are trying to pass to Judaize Jerusalem and at the same time, enter the Temple Mount in order to dismantle al-Aqsa and rebuild the temple. The steps that are being carried out, according to Islamic spokespersons, will lead to a third intifada. The Palestinian Arab assault on the Jewish connection to Jerusalem continues apace aided and abetted not only by radical Islamists or angry Silwanites but by fellow travelers in the media and in academia, including Israeli Jews. Consider the tours carried out by Emek Shaveh, an Israeli nonprofit organization, and Palestinian residents of Silwan with a view to rebuffing the "political archaeology of the Jews" and to prove the area's "true" archaeological significance. Emek Shaveh's founder Yonathan Mizrachi, who has voluntarily left his job at Israel's Antiquity Authority, spares no effort to downplay the Jewish biblical history of the area. As he put it: "After three hours on [an Israeli-organized] tour, you are convinced that you are at a totally Jewish site where evidence of Canaanite, Byzantine, and Muslim, and, of course, Palestinian [civilizations] are pushed aside. Jerusalem has 4,000 years of history. They only focus on the marvelous stories of King Solomon, David, and Hezekiyah, of which, by the way, they haven't found any archaeological evidence that ties them to the place." 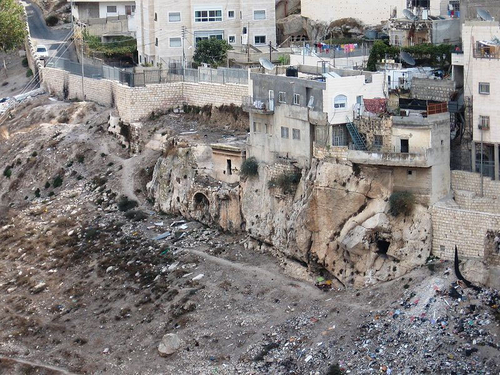 Mizrachi's website contains an essay of over 5,000 words—"Archaeology in Silwan"—which transforms archaeology into a handmaiden of social science pieties and criticizes even the use of the phrase City of David as a manifestation of settler objectives. In doing so, he also manages to rewrite history, claiming falsely that "during the main periods of prosperity under the kingdom of Judah … the cultural identity of the town and its inhabitants was contested." Sadly, the battle over Silwan (and for that matter the wider Palestinian-Israeli conflict) is likely to continue as long as Palestinian Arabs and their brethren refuse to recognize that another people, the Jews, have a claim to the Land of Israel. Shaul Bartal is a lecturer on Palestinian affairs at Bar Ilan University and author of The Fedayeen Emerge, The Palestine-Israel Conflict, 1949-1956 (Bloomington: Authorhouse, 2011). The Jerusalem Post, Aug. 27, 2010. "A Brief Guide to Haram al-Sharif," Supreme Moslem Council, Jerusalem, 1925. Die Welt (Hamburg), Middle East Media Research Institute (MEMRI), Washington, D.C., trans., Special Dispatch, no. 182, Jan. 26, 2001. See Daniel Pipes, "If I Forget Thee: Does Jerusalem Really Matter to Islam?" The New Republic, Apr. 28, 1997. Rivka Gonen, Contested Holiness (Jersey City: KTAV Publishing House, 2003), pp. 135–7. Eliel Löfgren, Charles Barde, and J. Van Kempen, "Report of the Commission appointed by His Majesty's Government in the United Kingdom of Great Britain and Northern Ireland, with the approval of the Council of the League of Nations, to determine the rights and claims of Moslems and Jews in connection with the Western or Wailing Wall at Jerusalem," Dec. 1930, UNISPAL doc A/7057-S/8427, Feb. 23, 1968. YNet News (Tel Aviv), Nov. 3, 2010. Nadav Shragai, "Rachel's Tomb, a Jewish Holy Place, Was Never a Mosque," The Jerusalem Center for Public and State Affairs, Nov.-Dec. 2010. "Tomb of Bilal," IslamicLandmarks.com, accessed Mar. 12, 2012. "The Two Palestinian Sites of al-Haram al-Ibrahimi/Tomb of the Patriarchs in al-Khalil/Hebron and the Bilal Bin Rabah Mosque/Rachel's Tomb in Bethlehem," 184 EX/37, United Nations Educational Scientific and Cultural Organization, Paris, Mar. 19, 2010. Fatah TV, Feb. 27, 2009. Al-Ayyam (Ramallah), Apr. 7, 2009. Palestinian Authority TV, May 1, 2009. Sari Nusseibeh and Anthony David, Hayo Hayta Aretz (Tel Aviv: Schocken Publishing House, 2008), p. 312. Marwan Abu Khalaf, Archaeological Center of al-Quds University, Jerusalem, interview, Palestinian Fatah TV, Feb. 27, 2009; Yonas Amar, Open al-Quds University, interview, al-Ayyam, Apr. 7, 2009; Hasan Sana-Allah, Center for Modern Research, Jerusalem, al-Ayyam, Apr. 28, 2009. Mahmoud al-Habash, Palestinian Authority agricultural minister, Palestinian Fatah TV, Apr. 16, 2009. Tayseer Rajab al-Tamimi, chairman, High Council of the Shari'a Court, al-Hayat al-Jadida, Mar. 2, 17, 2009. The New York Times, Aug. 5, 2005. II Kgs 20, 20; 2 Chron, 32, 3-4. Eyal Davidson, Yerushalaim Mikol Makom (Petach Tikva: Datiyur Publisher, 2003), pp. 30-1; Alon De Groot, "Jerusalem Waterfalls in the Days of the First Temple," Aidan, Jerusalem, 15, 1991, pp. 124-34; Roni Reich and Ali Shukrun, "The New Excavations in the City of David," in Avraham Faust and Eyal Baruch, eds., New Development in Jerusalem Studies, the Third Congress (Ramat Gan: Bar-Ilan University, 2008), pp. 3-8. Yosef ben Matityahu (Josephus Titus Flavius), Toldot Milhemet Ha-Yehudim Im Ha-Romaim (Tel-Aviv: Modan Publishing House, 1996), book 5, p. 298. "City of David," Conservation Dept., Israel Authorities Antiquities, Jerusalem, accessed Mar. 12, 2012. Jeffrey Yas, "(Re)designing the City of David: Landscape, Narrative and Archaeology in Silwan," The Jerusalem Quarterly, Winter 2000. Muhammad ibn Ahmad al-Muqaddasi, Ahsan at-Taqasim fi Ma'rifat al-Aqalim (Leyden: E. J. Brill, 1967), p. 171; Guy le Strange, Palestine under the Moslems: A Description of Syria and the Holy Land from A.D. 650 to 1500 (London: Alexander P. Watt for the Committee of the Palestine Exploration Fund, 1890), p. 221. Yakut Ibn Abdullah ar-Rumi al-Hamawi, Mu'jam al-Buldan (Leyden: E. J. Brill, 1959), vol. 3, pp. 125, 761; Strange, Palestine under the Moslems, p. 221. Safi ad-Din Abd al-Mu'min Abd al-Haqq al-Baghdadi, Marasid al-Ittila ala Asma al-Amkina wa al-Biqa (Beirut: Dar al-Ma'rifa, 1954), vol. 2, p. 296; Strange, Palestine under the Moslems, p. 222. Menashe Harel, Golden Jerusalem (Jerusalem: Gefen Publishing House Ltd., 2004), p. 244. Tamar Wisemon, "Streetwise: Yemenite Steps," The Jerusalem Post Magazine, Feb. 28, 2008. II Kgs 25:4; Jer. 52:7; Neh 3:15. "A Comprehensive Plan for Silwan: Development for Residents, Visitors and Tourists," Jerusalem Development Authority, p. 6, accessed Mar. 12, 2012. "Launch of the King's Garden Plan," The Jerusalem Development Authority and the City of Jerusalem, Mar. 2, 2010. Ha'aretz (Tel Aviv), June 30, 2010. "A Comprehensive Plan for Silwan, p. 20. Silwan … Siraa Bekaa Wawagud, al-Quds Foundation for Development and the al-Bustan Neighborhood Committee, Silwan, Jerusalem, Apr. 2010, pp. 1-3, 7-19. Ephraim Herrera and Gideon Kressel, Jihad Ben Halacha le-Maase (Tel Aviv: Ministry of Defense Publishing House and Kinneret Zmora Bitan, Dvir Publishing House, 2009), pp. 105-7. Silwan … Siraa Bekaa Wawagud, p. 5. Robert S. Wistrich, "Muslim Anti-Semitism: A Clear and Present Danger," The American Jewish Committee, 2002; al-Jami'a al-Islamiya, al-Mufawadat min Nuzur Islami (n.p. ), pp. 20-1; Muhammad Musbah Hamdan, al-Isti'mar wa-l-Sahyunia al-Alamia (Sidon: Dar al-Kutba al-Asriya, 1967), pp. 94-112. See Raphael Israeli, "The Islamic Movement in Israel," Jerusalem Letter, Jerusalem Center for Public Affairs, Oct. 15, 1999; L. Barkan, "The Islamic Movement in Israel: Switching Focus from Jerusalem to the Palestinian Cause," Inquiry & Analysis Series, report no. 628, Middle East Media Research Institute, Washington, D.C., July 30, 2010. Arutz Sheva (Beit El and Petah Tikva), Feb. 16, 2012. "Al-Hay'a al-Islamiya al-Masihiya lenasra al-Quds wa-al-Maqdassat," Islamic Jihad-Bait al-Makdas, Dec. 2009, p. 8. See "Sarakha Tahdhir min Mukhatat 'Kedem Yerushalaim' Urshalim Awalan," al-Aqsa Foundation for Waqf and Heritage ad; Ibrahim Abu Jaber, "Mashari Ta'hid Madinat al-Quds wa-Fars Ishti'al Intifada Thalitha," Modern Learning Center ad, Mar. 4, 2010. "About Silwanic," Wadi Hilweh Information Center, Jerusalem, accessed Mar. 29, 2012. Aviv Lavi, "Ha-Politika shel Nikbat Ha-Shiloa'h," NRG (Maariv news website, Tel Aviv), July 27, 2009; Idan Landu, "Me-Nishul Mufrat le-Militsiot Mufratot," Haokets website, Nov. 25, 2010. Yonathan Mizrachi, "Where Is King David's Garden?" Emek Shaveh, Jerusalem, accessed Mar. 29, 2012. Related Topics: History, Israel & Zionism, Palestinians | Shaul Bartal | Summer 2012 MEQ receive the latest by email: subscribe to the free mef mailing list This text may be reposted or forwarded so long as it is presented as an integral whole with complete and accurate information provided about its author, date, place of publication, and original URL.